Figure 1: Anacardium Occidentale fruit (left) and schematic process for cardanol recovery (right). Figure 2: Examples of cardanol’s potential functionalization. 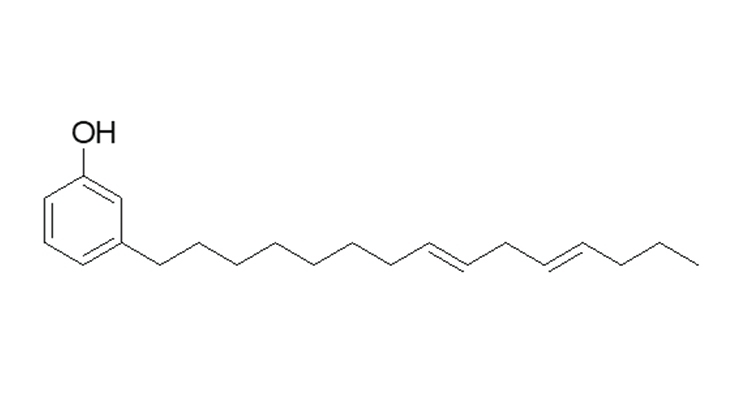 Figure 3: NX-2026 (3-pentadeca-dienyl-phenol) chemical structure. 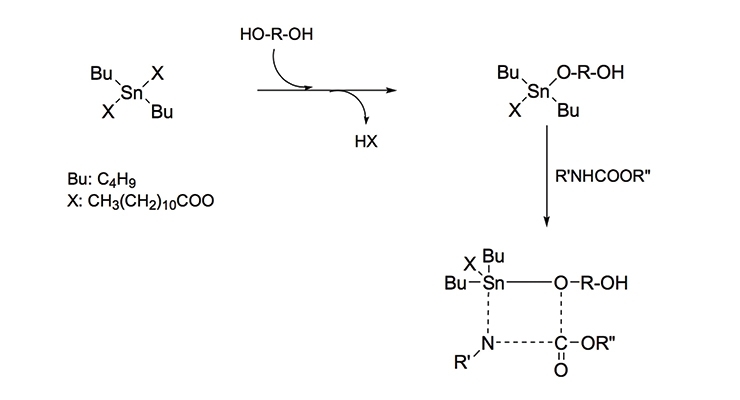 Figure 4: Possible reactions of blocked isocyanates. Figure 5: Proposed mechanism for PU depolymerization catalyzed by dibutyltin dilaurate. Figure 6: Effect of chain extender (amine) on deblocking temperatures of NX-2026TM-blocked prepolymers. 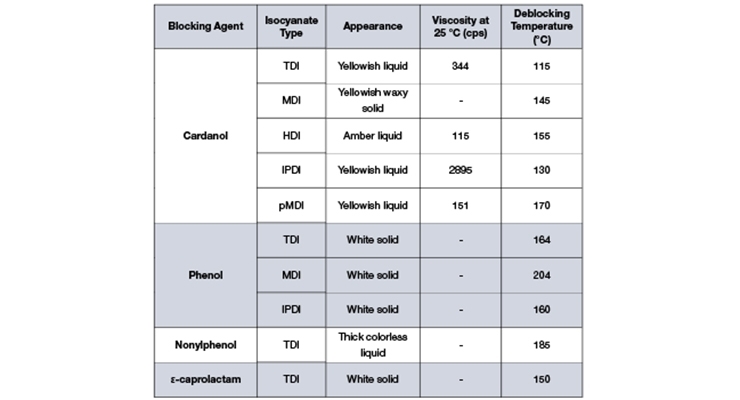 Table 1: Appearance and deblocking temperatures of blocked isocyanates. Table 2: Deblocking temperature and time for blocked PPG prepolymers. Table 3: Typical average deblocking temperatures for different PU substrates. Table 4: Effect of catalysts on deblocking temperatures of NX-2026-isocyanate adducts. Table 5: Effect of catalysts on deblocking temperatures of NX-2026-blocked prepolymers. Table 6: Effect of chain extender (polyol) and catalysts on deblocking temperatures of NX-2026-blocked prepolymers. 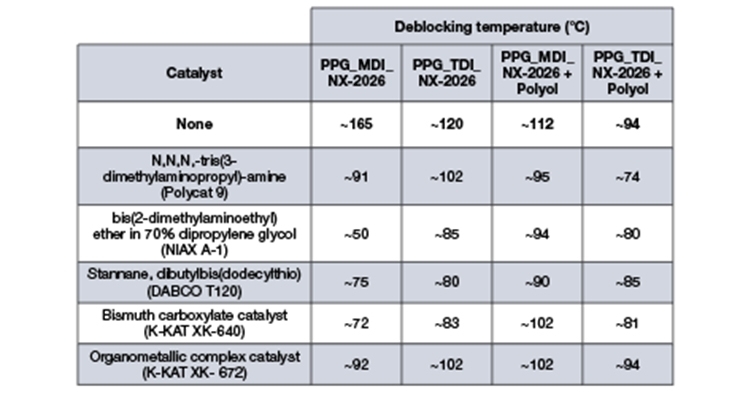 Table 7: Use of catalysts to tune deblocking temperatures on other types of NX-2026-blocked prepolymers. 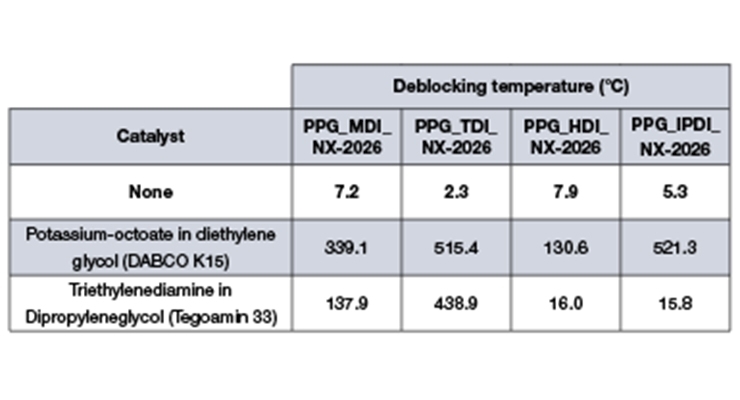 Table 8: MW variation (%, determined by GPC) of NX-2026-blocked PPG prepolymers in presence of very effective deblocking catalysts Tegoamin 33 and DABCO K15 after storage at 50 °C for 10 days. 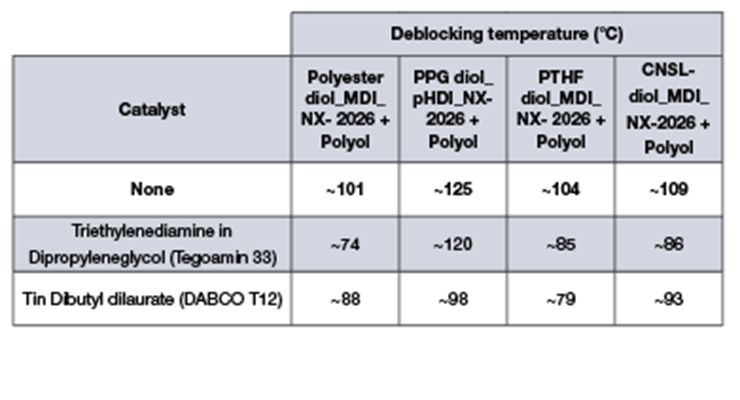 Table 9: MW variation (determined by GPC) of NX-2026-blocked PPG prepolymers in presence of a chain extender (propoxylated sorbitol polyol) and of very effective deblocking catalysts Tegoamin 33 and DABCO K15 after storage at 50 °C for 10 days. Table 10: Effect of chain extender (polyol) and alternative catalysts on deblocking temperatures of NX-2026-blocked prepolymers. 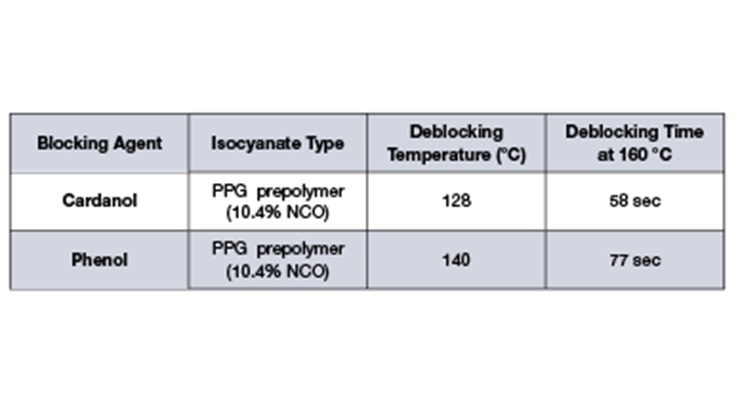 Table 11: MW variation (determined by GPC) of NX-2026-blocked PPG prepolymers in presence of a chain extender (propoxylated sorbitol polyol) and of alternative catalysts after storage at 50 °C for 10 days. Table 12: Effect of chain extender (amine) and catalysts on deblocking temperatures of NX-2026-blocked prepolymers. Cardanol, a well-known non-edible natural oil derived from the cashew nut shell liquid, is a USDA certified bio-based product. 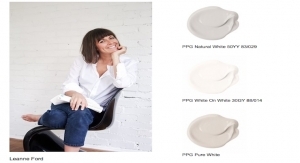 Once used as a very high purity grade (NX-2026,TM 3-pentadeca-dienyl-phenol) in PU prepolymers, this substance has demonstrated various benefits including favorable deblocking conditions, lower viscosity, and excellent storage stability compared to commonly used phenolic compounds. One of the most known deblocking methods involves exposure to elevated temperatures, i.e., 150 °C – 200 °C. However, not all substrates (e.g., plastics) and applications can accommodate such high temperatures for deblocking, thus, the possibility to optimize deblocking conditions can be a valuable tool to further expand the applicability of 3-pentadeca-dienyl-phenol as a label-friendly polyurethane prepolymers’ blocking agent. In this study, we present different approaches to control NX-2026 deblocking conditions. First, 3-pentadeca-dienyl-phenol blocked prepolymers were prepared starting from different diols (e.g., PPG, polyester, CNSL-based) as well as aromatic (MDI, TDI) and aliphatic (HDI, IPDI) isocyanates. These were subsequently characterized for their deblocking temperatures and used as model substrates for the study. Key factors for controlling deblocking conditions such as catalysts, deblocking agents (amines, polyols), and solvents were investigated. Cashew Nut Shell Liquid (CNSL), largely available in the entire sub-tropical areas (Brazil, India, Vietnam, Ivory Coast, etc. ), is a non-food-chain industrial oil found in the honeycomb structure of the cashew nutshell (Anacardium Occidentale), and is typically considered a by-product of the cashew nut industry. 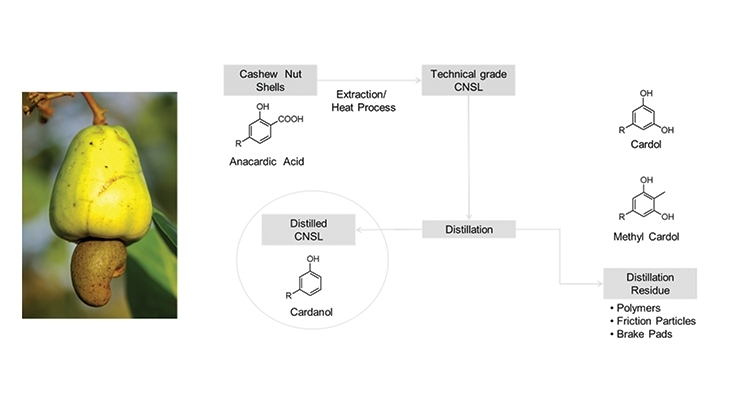 The main product isolated by vacuum distillation of CNSL under proper conditions is cardanol, a USDA certified bio-based (>98% bio-content) alkenyl-phenolic product with an average number of two unsaturations on the C15 side-chain (Figure 1). Cardanol represents an interesting and versatile monomer, as it contains three different functional groups (the aromatic ring, the hydroxyl group and the double bonds in the alkyl chain), that can be either selectively or simultaneously modified according to the expected features of the final product (Figure 2). 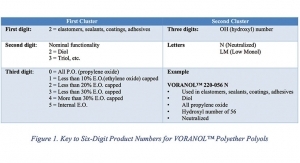 Given its peculiar chemical structure, several chemical routes to cardanol-based derivatives have been reported in the literature, including epoxies, amine curing agents, surfactants, friction particles, and phenolic resins.1 For example, one of the most successful CNSL applications are epoxy curing agents, a type of derivatives exhibiting good reactivity for fast and low temperature cure, strong adhesion even to damp or poorly prepared surfaces, excellent water resistance, corrosion protection and chemical resistance in epoxy formulations, all properties imparted by cardanol’s peculiar chemical backbone. All the average benefits described above have also been exploited in sectors like polyurethane systems, where cardanol has been described as a useful building block for polyols and derivatives suitable for 2K PU applications,2 aiming, for example, to improve PU adhesives and coatings durability by imparting hydrophobicity and chemical resistance. 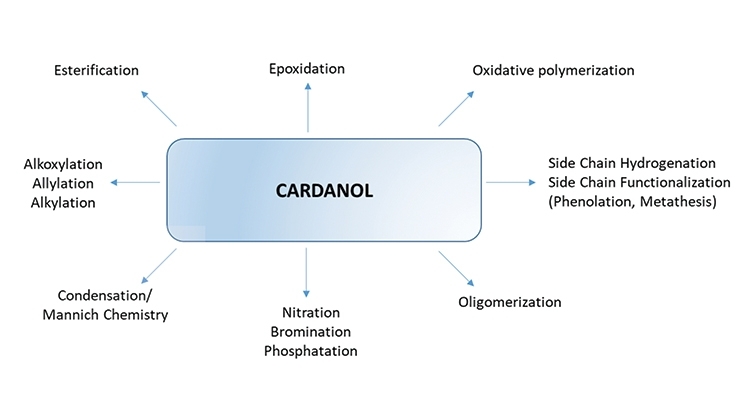 In order to further confirm the versatility of cardanol and its potential applicability in different sectors like 1K PU systems, among all the other grades already available in its portfolio, we recently developed a proprietary process for the recovery of the 3-pentadeca-dienyl-phenol [NX-2026 (Figure 3)]. NX-2026 has been specifically optimized to provide a light color and high purity raw material with reproducible hydroxyl value and functionality, overcoming the limitations of lower purity grades (generally simply called “cardanol”), such as smell, presence of by-products (e.g., cardol, 2-methyl-cardol) and potential batch to batch variability. Even if still applicable in the typical CNSL-based chemistries described above, NX-2026 offers further benefits, like being a valid alternative to common PU prepolymers petro-based blocking agents. 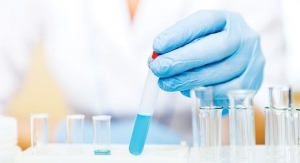 NX-2026 was selected as the blocking agent for isocyanates and lab prepared prepolymers. Prepolymers were prepared starting from commercially available diols (polyester, polyether) according to the following procedure: to a weighed amount of isocyanate pre-heated at 50 °C and stirred under nitrogen atmosphere, the selected diol was added dropwise, keeping mixture temperature around 65 °C. Once the addition was completed, the system was stirred under nitrogen atmosphere at 65-70 °C, monitoring prepolymer formation by NCO titration (ASTM D2572) on a METTLER TOLEDO T50 automatic titrator. When the desired NCO content was obtained, the prepolymer was then blocked by adding NX-2026, keeping reaction temperature around 65-70 °C under nitrogen flush and monitoring NCO disappearance by titration. A similar procedure was used to make isocyanate-NX-2026 adducts, still monitoring full NCO capping by automatic titration. Deblocking temperatures were determined by differential scanning calorimetry (DSC) on a METTLER TOLEDO DSC1 STAR System equipped with a HUBER TC45 thermostat. Gel permeation chromatography(GPC) analysis for molecular weight characterization of NX-2026-blocked isocyanates was performed on a HITACHI HPLC-GPC systems, isocratic mode (0.5 ml/min flow rate; wavelength set to 280 nm; Tosoh TSKgel Super H1000, Tosoh TSKgel Super H2000, Tosoh TSKgel Super H3000 columns 3 µm, 6x150 mm connected in series; mobile phase: tetrahydrofuran). 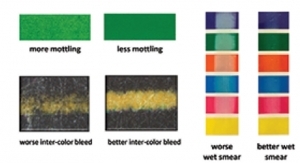 The benefits of blocked isocyanates are well-known in various industries including coatings and adhesives.3 Blocked isocyanate and blocked polyurethane prepolymer technology enable 1K polyurethane systems with reduced free isocyanates and extended storage stability by minimizing moisture sensitivity of the system. Coating applications such as electrodeposition, electrostatic spraying, powder coating, insulating wire coating, and coil coatings have extensively explored this technology because this approach provides a solution to minimize health concerns from free isocyanate exposure while allowing coatings to cure by heat. In the case of blocked prepolymers, they are used in 1K and 2K epoxy-amine adhesives, 1K polyurethane hot-melts, pressure sensitive adhesives, and sealants. Commonly used isocyanate blocking agents include phenol, nonylphenol (NP), methylethylketoxime (MEKO), alcohols, ɛ-caprolactam, amides, imidazoles, and pyrazoles. 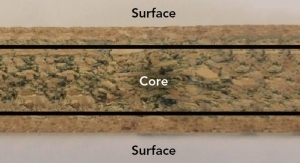 The chemical structure of the blocking group has a major impact on the deblocking temperature and cure rate of the coating or adhesive, and also impacts volatile content and final properties. 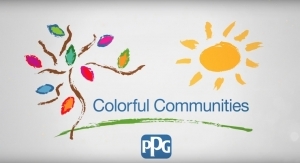 Phenol or substituted phenols have been employed as isocyanate capping agents for many years, but recent health concerns over toxicity of these molecules offered opportunities to develop safer and affordable alternatives. 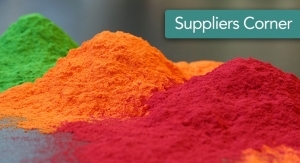 Cardolite has recently developed, through a proprietary technology, a very high purity product (99.5% pure as per GC analysis) commercially available under the trade name of NX-2026TM (3-pentadeca-dienyl-phenol). This grade has been studied as the most suitable bio-based, non-toxic alternative to aromatic blocking agents (phenol, nonylphenol). 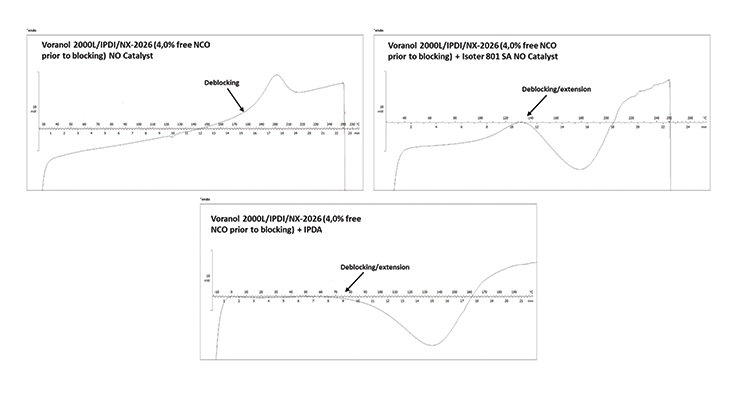 In order to first determine the behavior of NX-2026 as an NCO blocking agent, model isocyanate-NX-2026 adducts were prepared, using both aliphatic and aromatic isocyanates (MDI, TDI, IPDI, HDI, pHDI) and resulting adducts were then characterized for their deblocking temperatures. 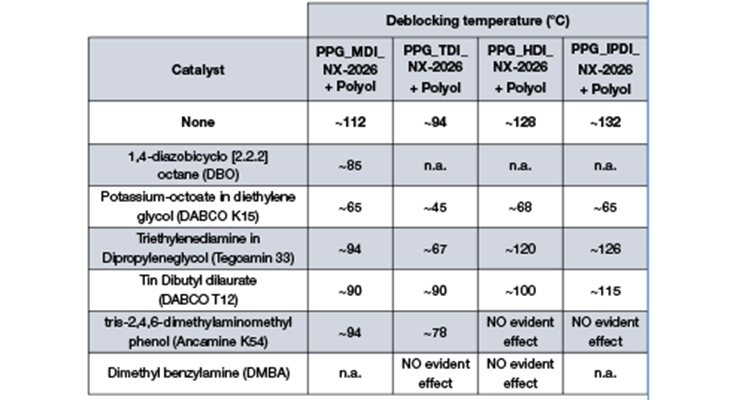 NX-2026 blocked isocyanates showed reduced viscosity compared to those of NP, phenol blocked systems and also exhibited favorable deblocking temperatures (Table 1). With these first results available, the study proceeded further, preparing a first model prepolymer (based on a polypropylene glycol-based diol with a MW of 1000 Da, monomeric MDI and with a 10.4% free NCO content) and fully blocking the isocyanate functional group by phenol and cardanol, respectively. 160 °C compared to that of phenol (Table 2), as per DSC analysis under the same conditions previously reported. 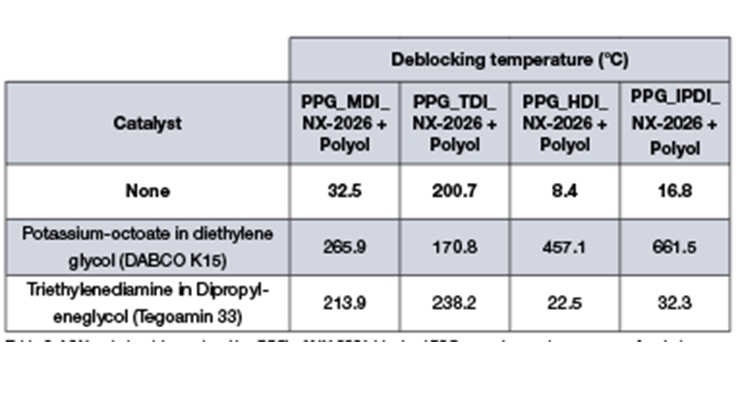 On the basis of these first results and aiming to confirm that NX-2026 blocked substrates follow the same deblocking temperature trends as typical blocking agents (Table 3,7), a wider set of polypropylene glycol (MW 2000 Da) based prepolymers obtained from different isocyanates (TDI, MDI, HDI, IPDI) with an average 4% free NCO content were prepared and fully blocked by NX-2026. 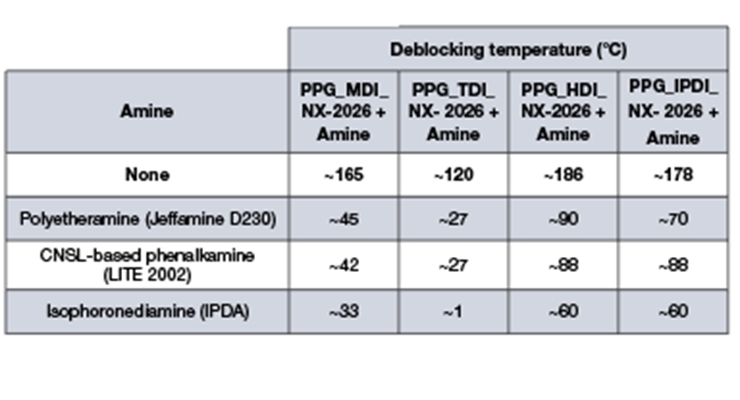 Since the first data collected (Tables 1, 2) show that NX-2026 is characterized by relatively high deblocking temperatures, that might limit its potential use as a versatile blocking agent in applications where very fast cure profiles are required or where substrates to be treated are thermosensitive (e.g., plastics). 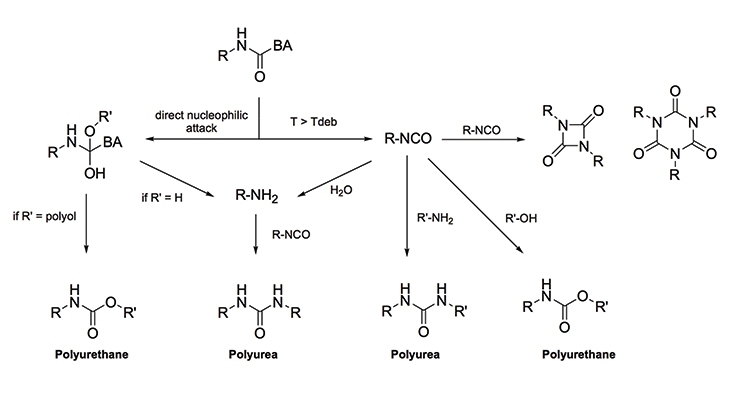 To address this topic and further investigate all the reaction pathways that blocked isocyanates could be subjected to (Figure 4,8), in addition to simple thermal deblocking, the impact of catalysts, chain extenders with different nucleophilicity (e.g., polyols and amines) or their combination were investigated. 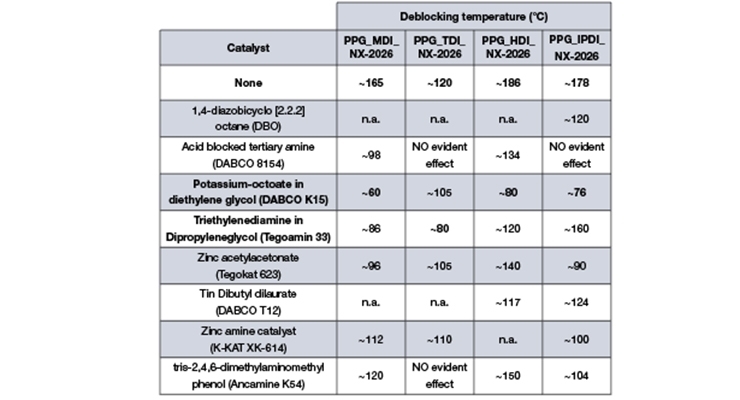 Using the very first NX-2026-isocyanate adducts described above as substrates, different catalysts (tertiary amines, alkanolamines, metals9) were added (0.8% w/w), in order to check their potential capability to lower deblocking temperatures (Table 4). Triethylenediamine (TEDA) in dipropylene glycol and potassium-octoate in diethylene glycol show the highest effect/deblocking efficiency within the series, while other options are still suitable, but showing a slightly lower contribution. 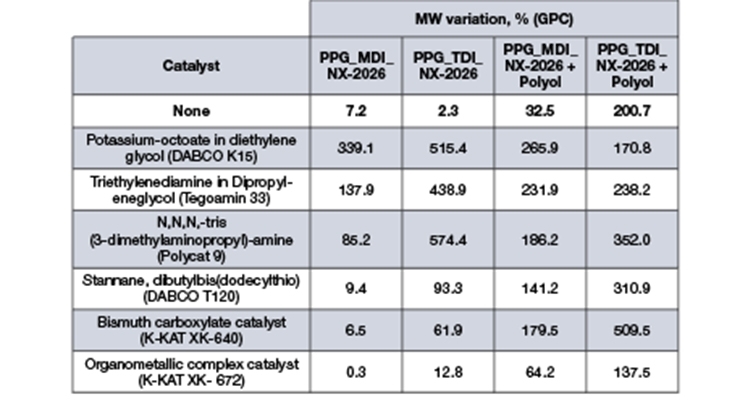 Even if suitable for a first screening, basic isocyanate-NX-2026 adducts are not truly representative of the polymeric substrates used in 1K PU applications; for this reason, the same catalysts have been tested on the NX-2026-blocked prepolymers previously mentioned (Table 5). A similar trend as for basic adducts is observed as well, with potassium-octoate in diethylene glycol and TEDA showing the biggest effect, with a quite significant drop on prepolymers deriving from aromatic isocyanates (MDI or TDI). With these promising results available, the study was further extended to slightly more complex systems, evaluating the use of chain extenders (as such or in combination with catalysts) characterized by different nucleophilicity (polyols and amines). When a propoxylated sorbitol-based polyol (OH 300 mg KOH/g) is used as a potential chain extender (at a stoichiometric level with respect to the prepolymer’s equivalent weight), a reduction in deblocking temperature is observed, becoming even more significant when catalysts (0.8% w/w with respect to overall substrate amount) are included in the blend (Table 6). The evident effect of metal catalysts (e.g., dibutyltin dilaurate or potassium octoate) on deblocking temperatures can be explained by their ability to generate very nucleophilic metal alkoxylates in the presence of polyols and polar solvents (such as DEG, in the case of potassium octoate glycolic solution). The same mechanism is also described in the literature as a useful tool to depolymerize PU matrices like flexible foams (Figure 510). 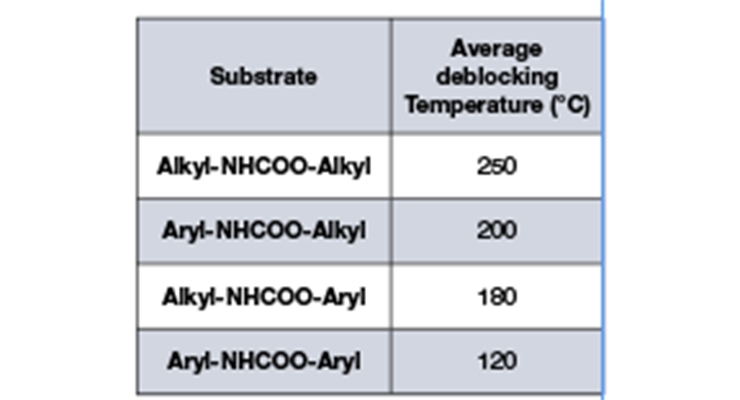 Various model NX-2026-blocked prepolymers were tested and characterized for their deblocking temperatures as neat substrates or when catalysts were included in the blend (Table 7). In particular, a polyester diol (OH 56 mg KOH/g), a PPG-based diol (OH 56 mg KOH/g), a PTHF-based diol (OH 56 mg KOH/g) and NX-9201LP (CNSL-based diol, OH 65 mg KOH/g) were selected as starting diols for prepolymer synthesis, in combination with monomeric MDI and polymeric HDI as isocyanates. 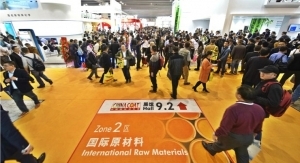 The resulting prepolymers were characterized by their different free NCO content prior to NX-2026 blocking, being 6% for the polyester diol/MDI prepolymer, 10.5% for the PPG/pHDI prepolymer, 3.6% for the PTHF/MDI prepolymer and 4.0% for the CNSL-diol/MDI prepolymer. The same synthesis conditions to make the starting prepolymers and to achieve their complete blocking by NX-2026 were adopted, confirming the applicability of NX-2026 as a blocking agent. 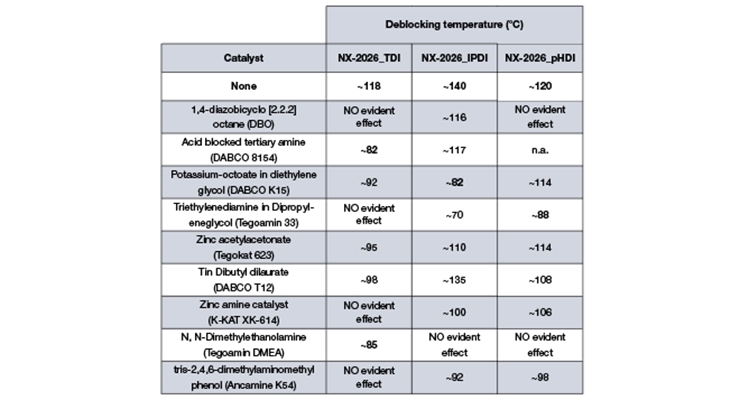 Two of the catalysts previously described (TEDA in dipropylene glycol and dibutyltin dilaurate) were tested, showing a contribution to deblocking temperature reduction comparable to previous results (Table 7). As evident from the results shortlisted in Tables 5-7, amine- and metal-type catalysts diluted with glycols (e.g., Tegoamin 33 and DABCO K15) show the overall best effect in reducing the deblocking temperatures of blocked prepolymers. However, their high nucleophilicity could potentially limit their applicability in 1K systems, due to limited shelf-life (stability) of the blocked prepolymers. 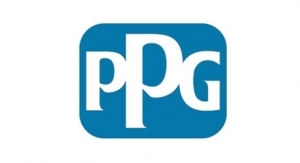 To confirm this assumption, the four model NX-2026-blocked PPG-based prepolymers used for the study were characterized for their molecular weight variation (by GPC) after storage for 10 days at 50 °C (corresponding to ~3 months at room temperature), both as neat samples and as added with catalysts (Tegoamin 33; DABCO K15; 0.8% load with respect to the substrate). If a significant amount of deblocking occurs over storage time, then the resulting free prepolymer can crosslink (also favored by the presence of a catalyst), thus causing an increase in molecular weight or, in general, a significant difference in the MW distribution. Even if there could potentially be factors affecting the accuracy of molecular weight characterization based on hydrodynamic volume comparison between polymer standards (e.g., polystyrene) and polymer analytes having different chemistries, GPC represents quite a useful tool to screen several substrates by using small amounts of materials. The thus obtained MW variations (Table 8) showed good stability for neat blocked prepolymers. When Tegoamin 33 is used, aliphatic isocyanates (HDI, IPDI) derived prepolymers show a limited variation in MW, while it becomes more evident for aromatic systems (MDI- and TDI-based). The effect is even worse for DABCO K15 containing blends, almost all showing a complete gellation. The same characterization was extended to systems where the same blocked prepolymers were blended with a polyol as chain extender (as described in Table 6), still using Tegoamin 33 and DABCO K15 as catalysts. In this case, the contribution of both chain extender and catalyst results in a higher MW variation (Table 9), that, even if less marked for HDI and IPDI systems, still highlights the limited applicability of very active catalysts (e.g., DABCO K15) in 1K PU systems as a tool to reduce deblocking temperatures without affecting blocked prepolymers shelf-life. 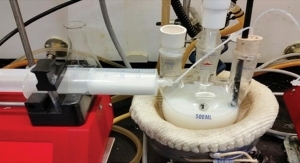 These results prompted the search for possible alternative catalysts, able to contribute to the reduction of the deblocking temperature (even if lower than for the former ones), but without affecting systems shelf-life. 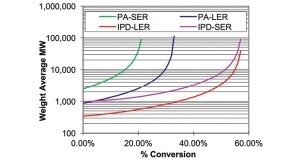 Considering the results obtained with aromatic isocyanate-derived prepolymers, whose shelf-life is highly reduced by the presence of catalysts, specific attention was given to the same model NX-2026-blocked MDI- and TDI-based PPG prepolymers used in the rest of the study. The second set of catalysts (still selected among amine- and metal-based ones) show a lower effect on deblocking temperatures with respect to the most efficient ones belonging to the first series (e.g., Tegoamin 33 or DABCO K15), but still providing a significant deblocking temperature reduction for all the model prepolymers, with or without the presence of a polyol as curing agent (Table 10). Following exactly the same approach as previously described, testing by GPC the MW variation of blends NX-2026-blocked PPG prepolymers as such (Figure 8) and in combination with a chain extender (propoxylated sorbitol polyol) and alternative catalyst (Table 11), after storage at 50 °C for 10 days, new sets of results were collected. The alternative catalysts show, especially in the case of MDI-based systems, a general lower impact on shelf-life reduction (average lower increase in MW), while with TDI-derivatives there is still an increase in molecular weight (even if lower than for Tegoamin 33 or DABCO K15). Having confirmed the possibility of extending NX-2026-blocked prepolymers by polyols (also reducing deblocking temperature) as well as the applicability of proper catalysts to further reduce the reaction temperature without affecting blocked prepolymers shelf-life, further experiments were conducted to evaluate the efficiency of amines as chain extenders/curing agents characterized by higher nucleophilicity (Table 12). The four same reference model blocked prepolymers were blended with amines (Jeffamine D230, LITE 2002, IPDA, respectively) at a stoichiometric level using the amine’s AHEW (amine hydrogen equivalent weight) with respect to the prepolymer’s equivalent weight. Among the three amines tested as chain extenders (isophorone diamine, polyetheramine, CNSL-phenalkamine), the amine characterized by the lowest molecular weight shows the highest effect on deblocking temperature, probably due to its lower steric hindrance and the subsequent easier access to reactive groups (Figure 6). 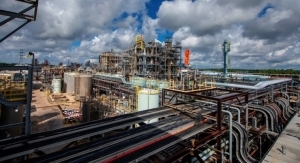 The addition of catalysts in amine-type chain extenders can be a possible way to further reduce their deblocking temperatures, if necessary. Depending on the specific type of system (1K or 2K), catalysts or chain extenders can be blended into NX-2026 blocked isocyanates-derived adducts, properly tuning their level and nature in order to have good balance between reactivity and formulation stability over time. 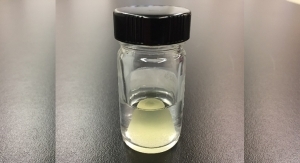 Cashew nutshell liquid (CNSL), a non-food chain, bio-renewable alkenyl-aromatic, offers unique chemical features that can be successfully used in polyurethane applications. Its highly pure derivative NX-2026 can be successfully used in 1K systems as an isocyanate blocking agent, representing an efficient alternative to petro-based phenol and nonylphenol. By properly selecting suitable conditions (use of catalysts, chain extenders or their combinations), NX-2026 deblocking temperatures can be tuned, offering formulators a valid and versatile chemical tool. Future work will focus on expanding the number of NX-2026 blocked systems, with specific attention to different catalysts and their load with respect to the blocked-prepolymer to further improve system stability.